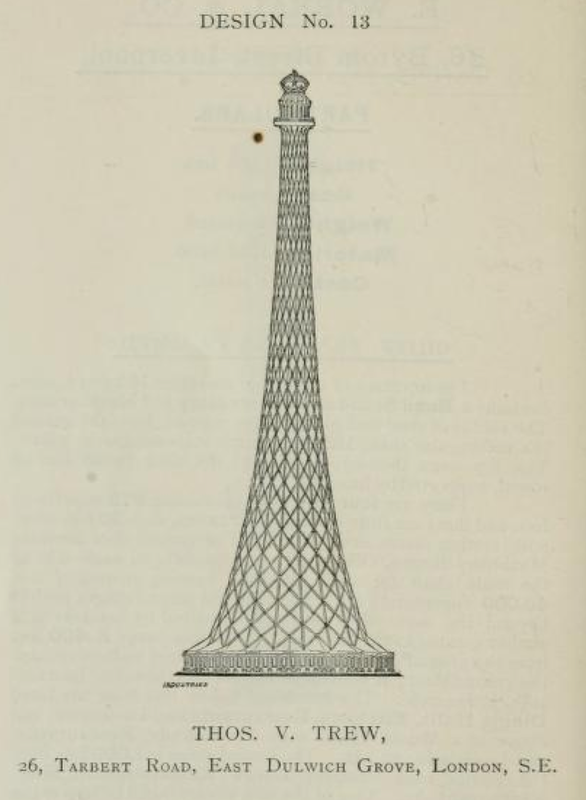 "Taking into consideration the enormous popularity of the Eiffel Tower and the consequent pecuniary benefits conferred on those interested in that undertaking, it is not too much to anticipate that, in the course of a short time, every important country will possess its tall Tower." 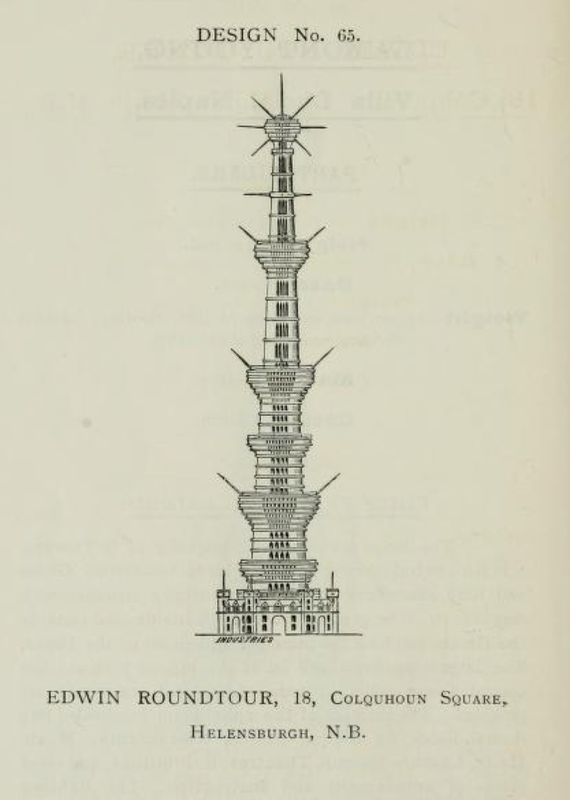 So said a pamphlet released in 1890 entitled Descriptive Illustrated Catalogue of the Sixty-Eight Competitive Designs for the Great Tower for London. 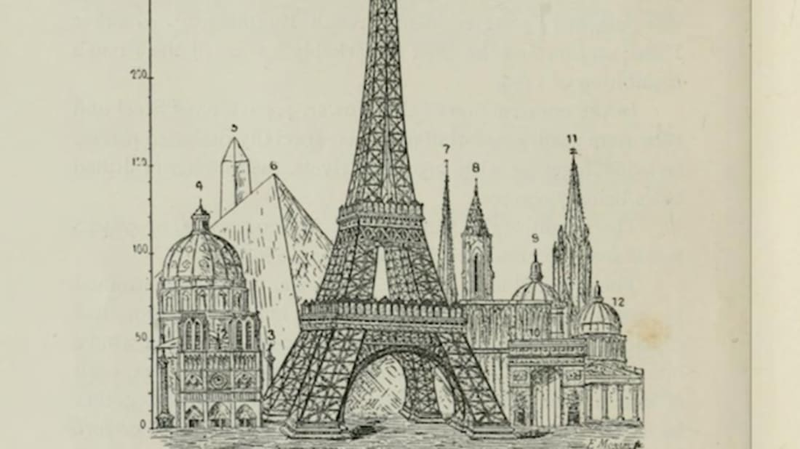 Unfortunately, Fred C. Lynde, writing on behalf of the Tower Company, Ltd., was wrong about the Eiffel Tower's influence on international architecture, and London's own never came to be. But let's back up. 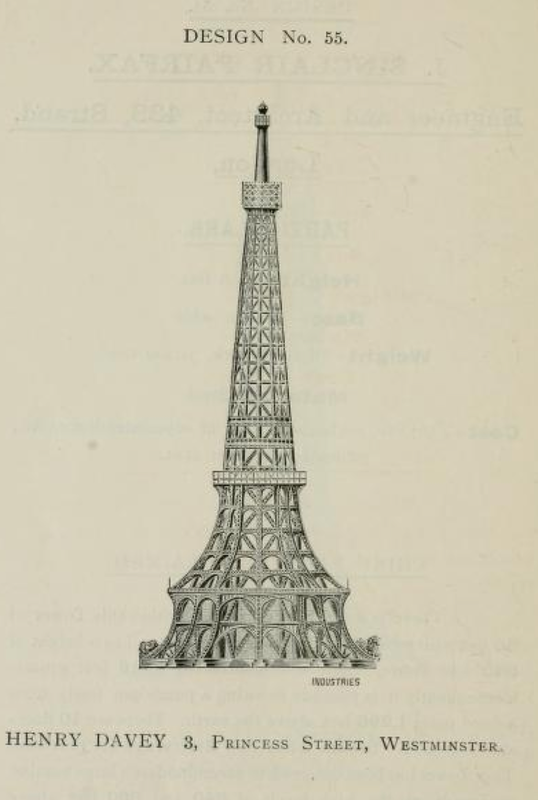 After the Eiffel Tower debuted as the entrance to the 1889 Paris World's Fair and the then-tallest man-made structure in the world, Sir Edward Watkin, a member of the British Parliament and newspaper and railway entrepreneur, supposedly vowed that "anything Paris can do, we can do bigger." His patriotism was probably well received, but it wasn't the only motivation for his founding of the Tower Company, Ltd. Watkin was also the chairman of London's Metropolitan Railway, which was being extended around that time out into the surrounding countryside. Eager to incentivize Londoners to patronize his railway, Watkin planned to open a park, resplendent with amenities, near a proposed station at Wembley. The Tower was to be the centerpiece of this park. 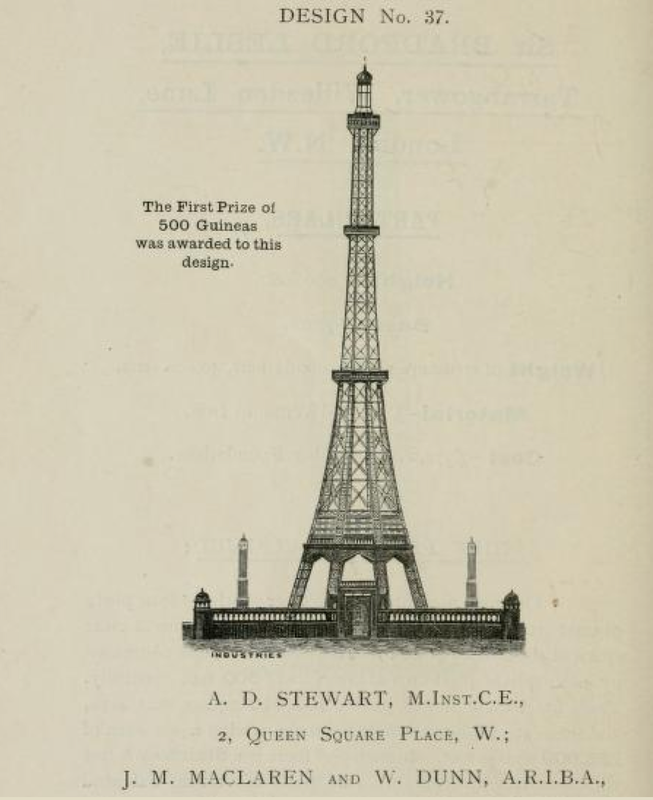 When a request to Gustave Eiffel himself was denied, Watkin's Tower Company launched a design competition in November 1889 to solicit proposals for the Tower. Sixty-eight plans were submitted from architects all over the world—and although a winner was chosen, the project was never completed. Construction began in 1892 but stalled four years later with just the first of four levels complete. The ground they had chosen to build on turned out to be marshy, and with the crowds not flocking to the park as Watkin anticipated, funds ran dry. 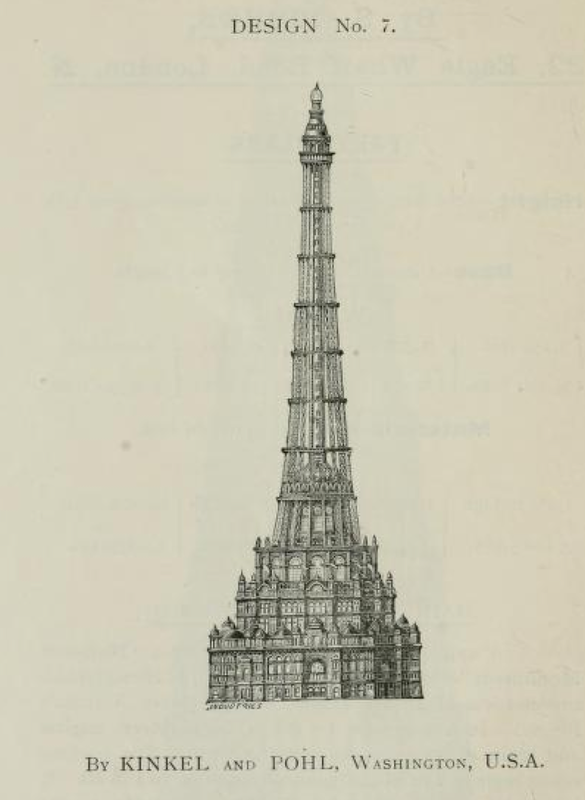 In 1899, the Tower Company was liquidated, although their unfinished project—known as "Watkin's Folly" or "The London Stump"—remained until it was demolished in 1904. 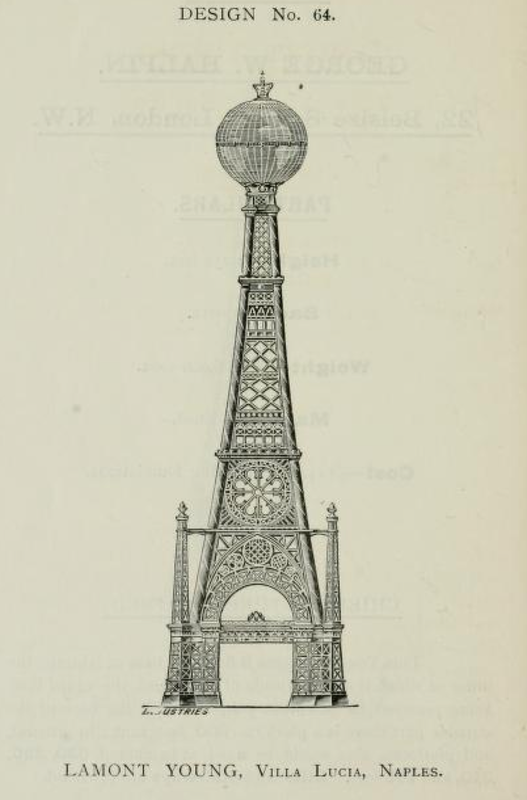 London never got her Great Tower, but the catalog presents an imaginative and sometimes fanciful array of what could have been. 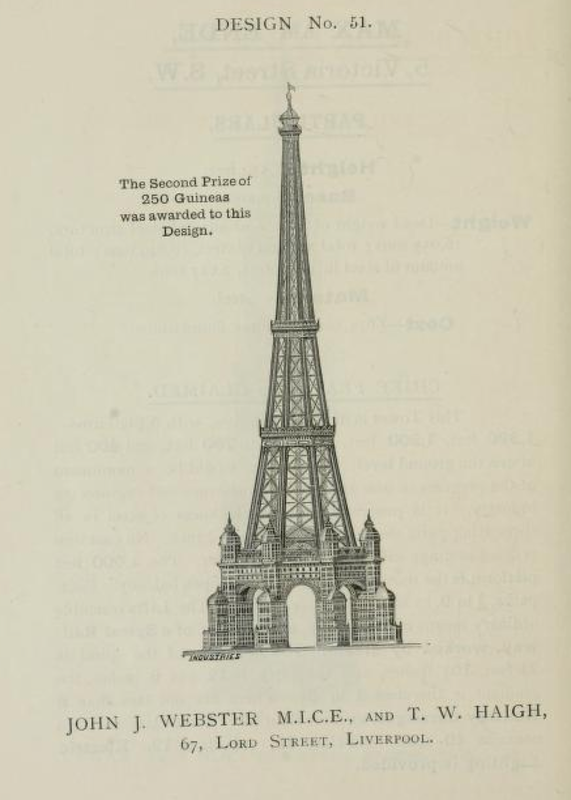 This design by Stewart, MacLaren and Dunn ended up being chosen as the plan for the ill-fated Tower. The architects were awarded 500 guineas—a short-lived British coin equal to 20 shillings—for their effort. The proposal included plans for a 90-room hotel housed inside the 1200 foot structure. 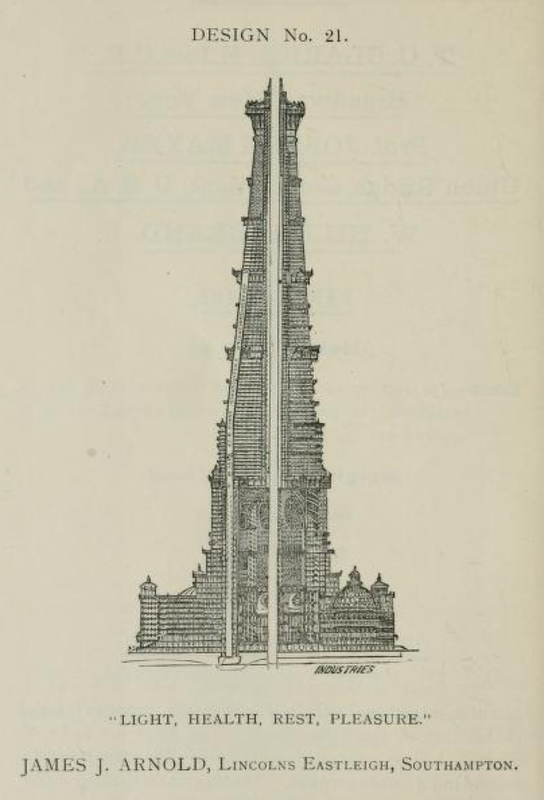 The second place prize of 250 guineas was awarded to this design from Webster and Haigh for a 1300-foot Tower that the architects imagined would be heavily occupied. The buildings on the first level were "adapted for Hotels, Restaurants, Residential Flats, Offices, Warehouses, Stores, etc., Concerts and other entertainments." There was also to be a balcony level that could comfortably seat 3000 people. This proposal, from an American architect, would have included a scientific observatory as well as recreational space. 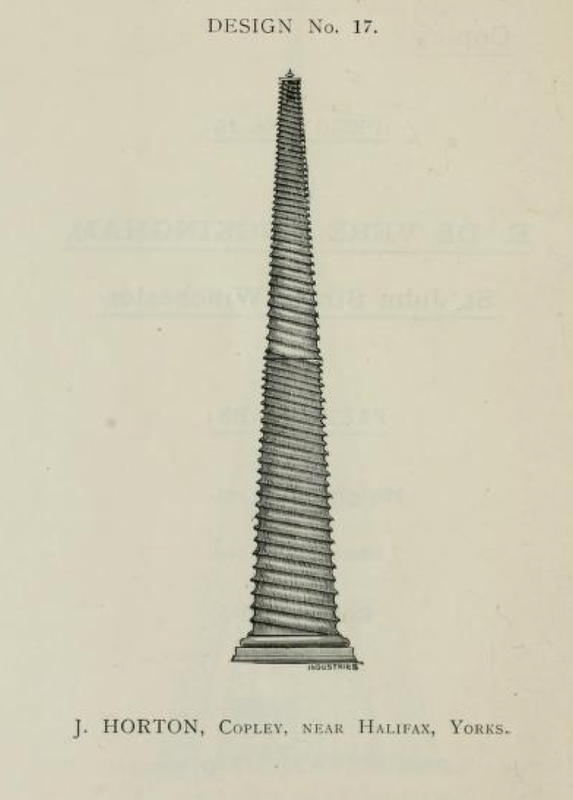 A Canadian architect proposed this design, which resembles a modern skyscraper, and boasted, "capability of being taken down in sections—each section being useful for other purposes." 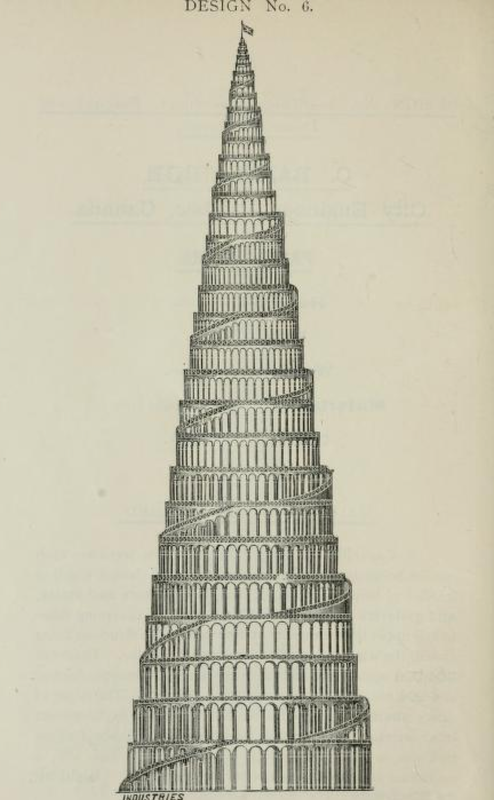 S. Fisher was perhaps overly ambitious when he drew up plans for a 2000 foot "Monument of Hieroglyphics emblimatical of British History during Queen Victoria's Reign" (whatever that means). 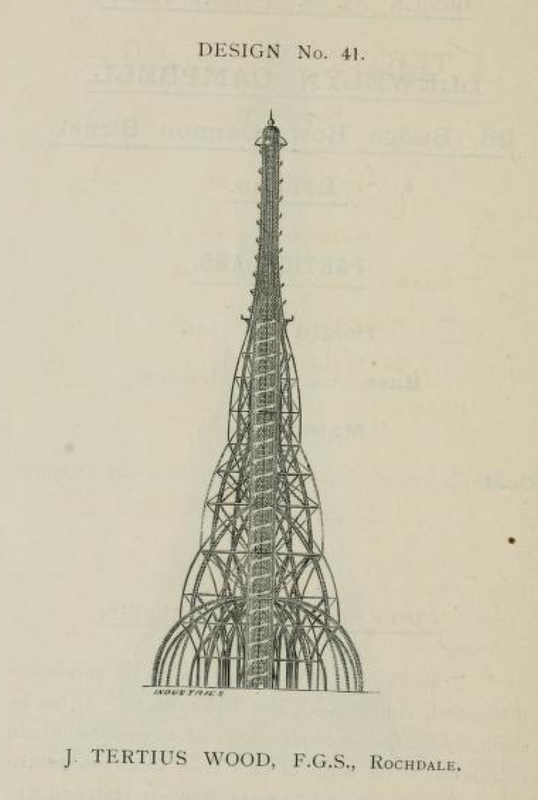 In addition to the staggering height—more than double the size of the Eiffel Tower—this design was probably nixed for the ahead-of-its-time locomotive engine that Fisher imagined would carry visitors upwards on a spiraling track. No futuristic contraptions or sky-high heights in this American-made design. But the "modern Indian Oriental style" is beautiful in the depiction. 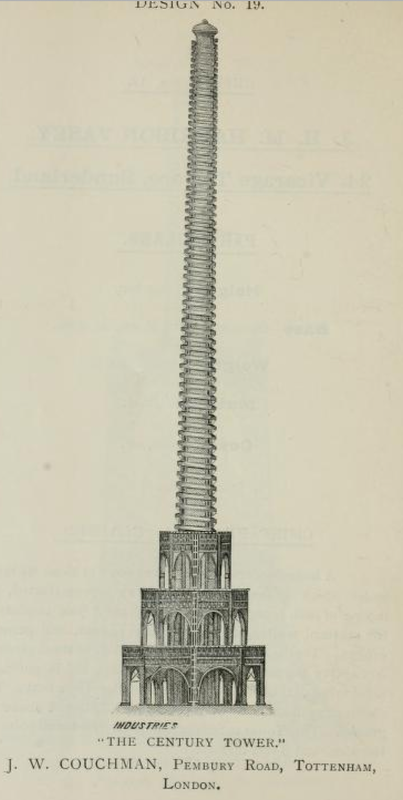 E. Worral and Co. deviated from the conical majority for a lean tower with a glass-roofed restaurant on the top level. Thomas V. Trew's design was full of symbolic value, meant to resemble the "Crown," with the "Colonies and British possessions for the base." J. Horton's giant screw certainly stands out—although the addition of spiral tramcars makes it seem more like a proto-roller coaster than a national monument. J. W. Couchman's proposal came without much exposition, but the unusual shape was given a name: "The Century Tower." 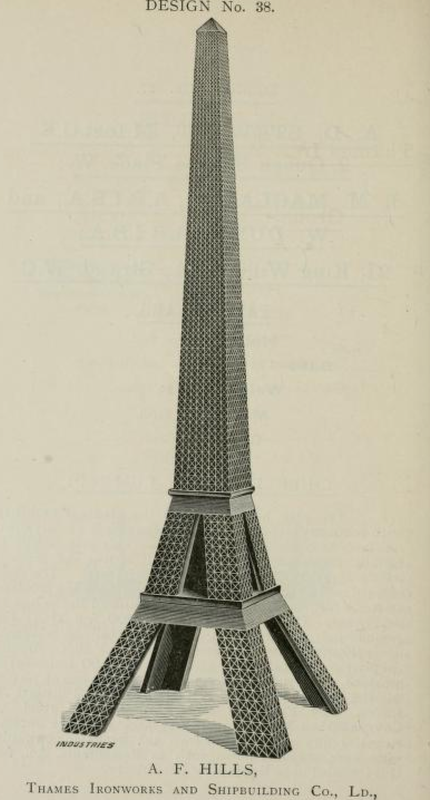 This hexagonal submission was to be covered in glass so as to resemble a "Crystal Tower." 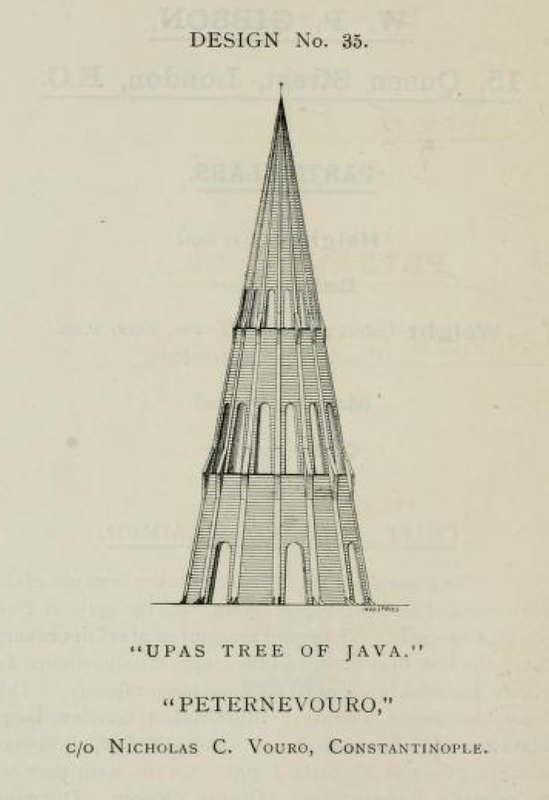 For some reason, the architect from Constantinople named his tent-like tower after a poisonous tree found primarily in Africa. 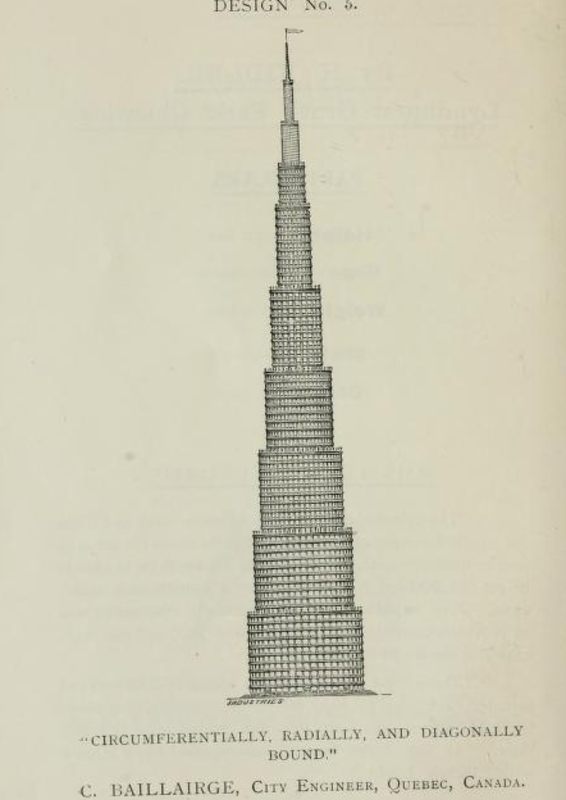 A. F. Hill's super-sized submission was designed to resemble the "Monoliths of Ancient Egypt" and was supposed to house everything from international courts, flower and fruit shows, hotels, and mansions to an observatory 1960 feet up in the air. 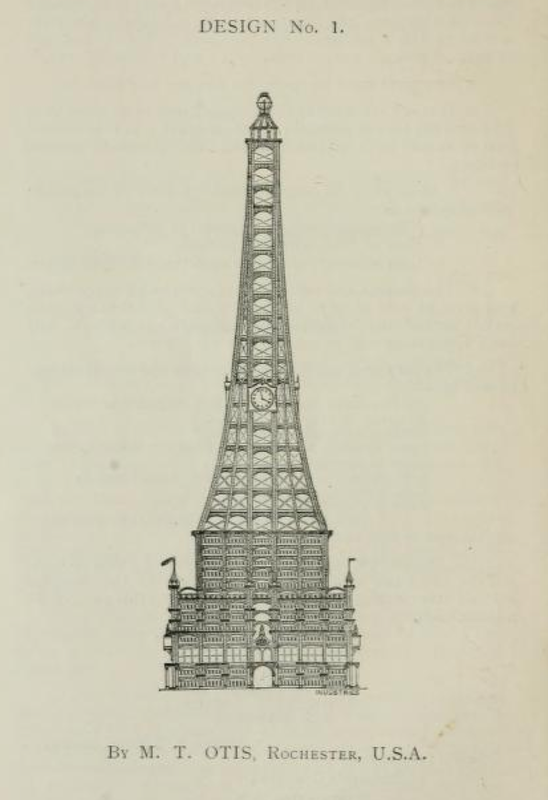 The series of domes that form the exterior of this Tower are unique in form but the proposed specially "trained mules to carry people up the spiral incline" are perhaps the most distinguishing aspect of the design. 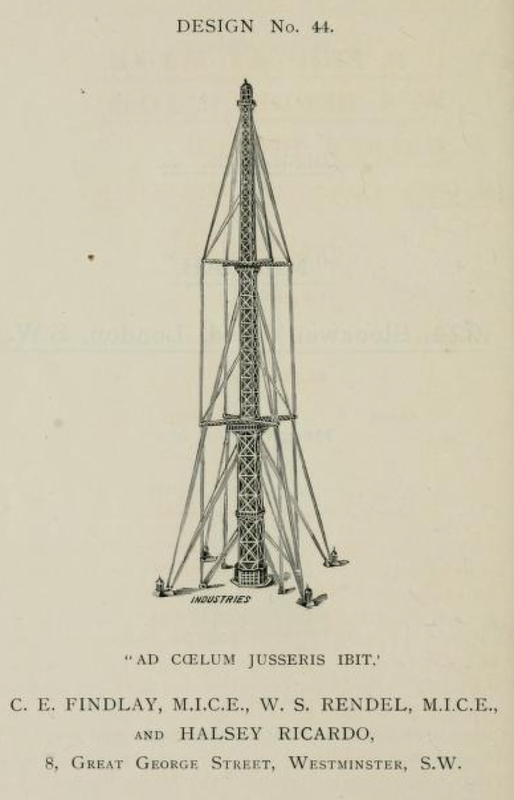 Economy was surely a factor in Watkin's consideration of the different design proposals, but this barely-there tower—anchored by wire ropes to save on material costs—was probably not what he had in mind. 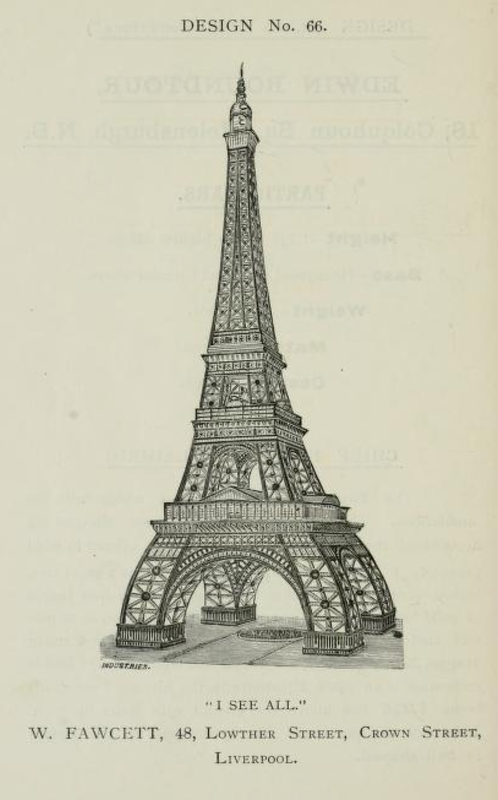 Robery Wylie's design riffs off the Eiffel Tower as well. But it does so with stunning, intricate detail. The design from Max am Ende stands out from the rest with a classic Gothic style of architecture. The base of webbed design from Henry Davey was proposed as an indoor Winter Garden. The interior of the giant terrestrial globe atop this design would itself house a number of floors of recreational activities. 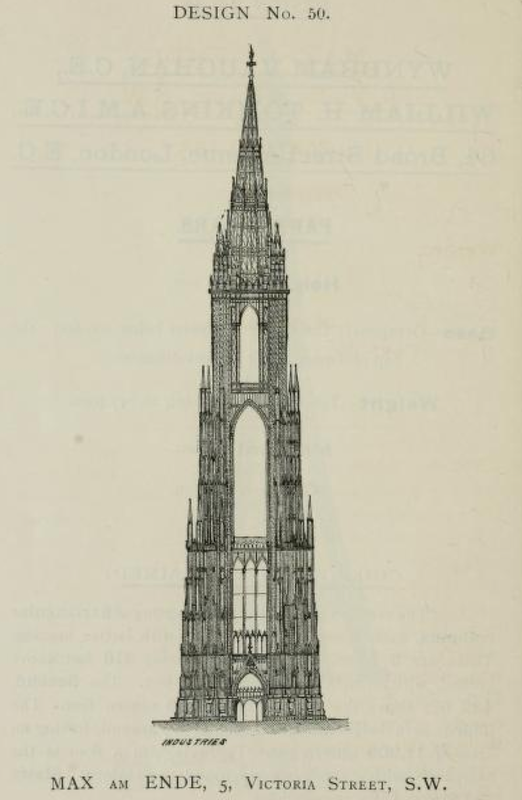 The odd shape of Edwin Roundtour's design was intended to mimic that of a tree, and thereby cut down on the wind resistance, which posed a threat to the teeteringly tall Tower Watkin hoped to achieve. 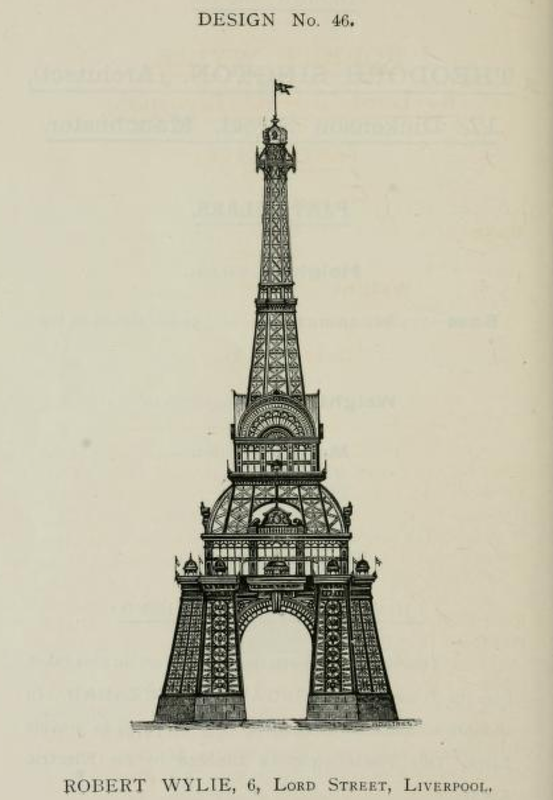 An Eiffel Tower knock-off ominously named "I See All." All photos courtesy of Archive.org.